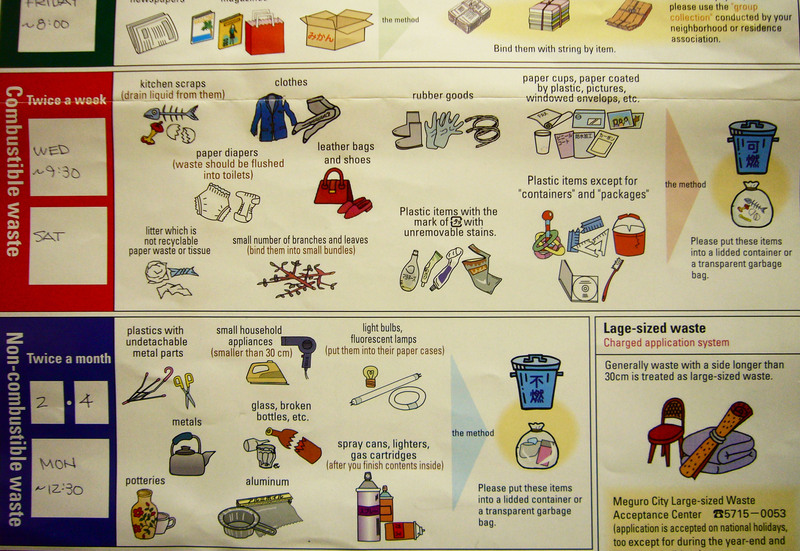 Tomorrow’s trash challenge, as outlined on my handy garbage guidelines poster. Foreigners are legendary at garbage fail in Japan, but anxiety about Doing Trash Right runs deep here, even among native-born Nihon-jin. In a Japanese soap opera I watched recently, one housewife mercilessly bullies her neighbor by sneaking The Wrong Kind Of Trash into her bags once they’d been put out at the curb, causing them to be rejected day after day by the garbage collectors. It’s no joke! • Paper cups, paper coated by plastic, pictures, windowed envelopes, etc. And that’s just the Saturday list. Garbage is collected here five days a week, but it’s different stuff every day. Monday is Non-Combustible Waste Day, Wednesday they cart away Combustible Waste again, Thursday is paper goods, and Friday is four kinds of recyclables (all items washed, crushed or bundled and bagged by type). Really, the only way to deal with this is to throw it away correctly in the first place. Don’t make my show you how many trash cans I have in my tiny kitchen. how can anyone do anything BUT organize their waste there? That is astonishing. It’s really making me conscious of what I buy, because it’s such a pain to throw away excessive packaging. The one thing you can never have too much of, though, is approved “combustible” bags. Since each kind of trash has to be put out separately, these disappear at an alarming rate! That is stunning, and I think only in Japan, where there’s so much attention to detail, could such a trash system exist. Can an entire culture have OCD? Could this even be feasible if someone–grandma, or mama–wasn’t in the household full-time? Actually, it’s not a job that can fall to one person in the household – in real life, people don’t sort their trash after it’s thrown away, each person sorts it as he or she tosses it out. Most people set things up so that it’s just as easy to put trash in the right container as the wrong one, and they grow up knowing which kind of stuff goes in which category. And for the stuff you can’t quite figure out where it belongs, there’s a 20-page supplemental booklet that helpfully lists everything including the kitchen sink, what category it belongs in, and how to dispose of it. For example: used batteries. These have to be dropped off in special boxes at various Ward Office facilities. Used ink cartridges: you have to take the empties back to the store where you bought them. LIke that. I can’t even get my kids to throw their garbage out instead of dropping it wherever! One advantage to living in Segagaya-ku is we no longer have to separate paper and plastic. Take that, Meguro-ku! Hah!